This page will pull the information from your shipping settings to display your shipping zones. You'll want to make sure the rates that show up here are accurate to what you want to offer! 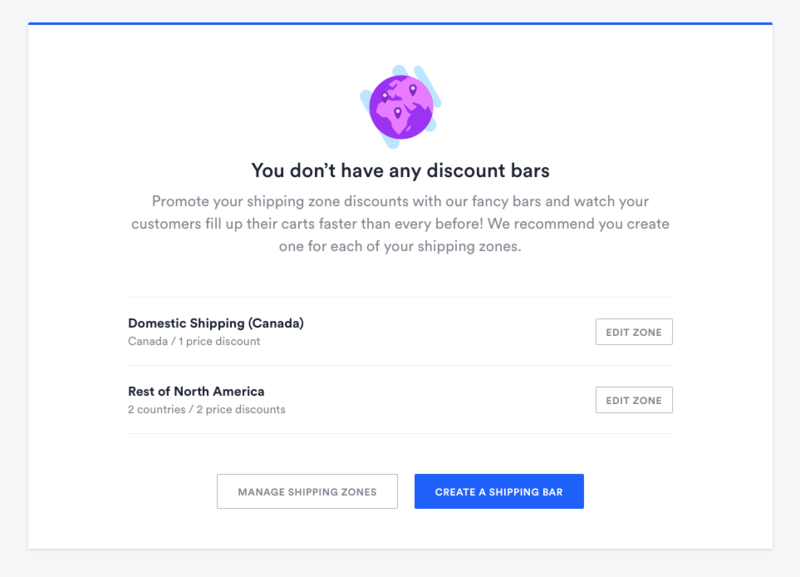 The shipping settings are controlled by Shopify, but you can get there directly by clicking the 'Edit Zone' buttons or 'Manage Shipping Zones'. If you haven't set up any shipping rates yet, or want some more information about how the process works, you can click this link to take you to the Shopify documentation about shipping rates! If it's a bit overwhelming reading the guides, or you'd prefer speaking to someone about it directly, you can contact Shopify Support from this link here. Once you're confident in how the shipping rates and zones are set up, click the blue 'Create a shipping bar' button, and off you go!